Lots 244 & 246 244: Queen Anne tavern table, maple, oval table top, straight cabriole legs terminating in pad feet, W.A. Smith Auctioneers (Plainfield, NH) sticker adhered to apron, scrubbed table top of two boards split at center, top also with two rough in-filled areas and projecting peg, underside of table with good color, 26 ¼" h. x 33 ½" w. x 25 ¼" d. 246: 19th C. Shaker [Mt. Lebanon, NY] rocking chair, No. 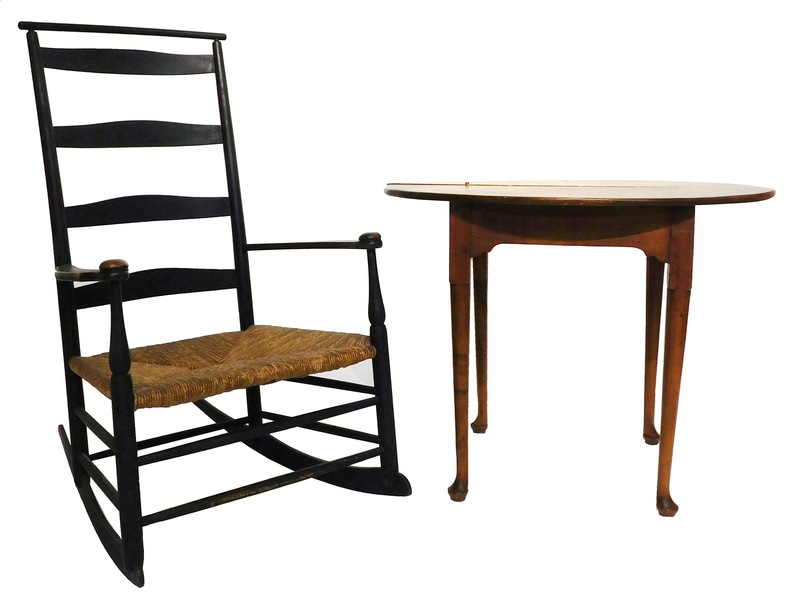 7, four shaped ladder slats below a curved shawl rail, turned posts and shaped arms with mushroom arm caps, rush seat, box stretcher with inset shaped rockers, black-painted finish, 41 ½" h. x 25" w. x 32" d.